Reggie takes in the city skyline at the Redbirds Rising Chicago campaign event. Almost one year to the day since the public launch of Redbirds Rising: The Campaign for Illinois State, alumni, donors, and friends gathered on a ship in Chicago to celebrate Illinois State and demonstrate the impact that philanthropy is having on students through Scholarship, Leadership, and Innovation. Each of the ship’s decks reflected one of the campaign pillars. Leadership Rising was the theme on the first deck where students shared their experience developing as leaders through programs and activities offered at Illinois State. Nearly 30 scholarship recipients hosted the second deck, Scholarship Rising, sharing with guests how philanthropy has enhanced them personally as students at Illinois State. Innovation Rising was the theme for deck three. Students on that deck used tablets displaying 360-degree video of campus spaces to demonstrate how innovation enhances areas of campus. 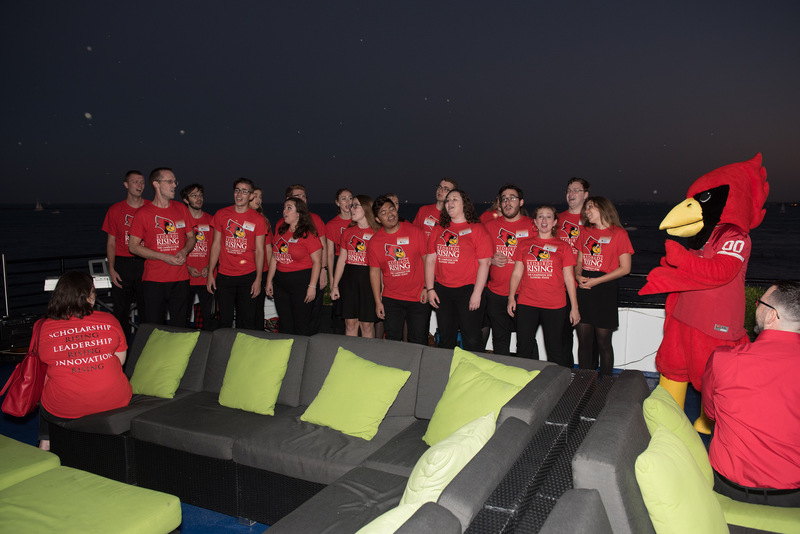 On the top deck, the Madrigals sang for guests who enjoyed an evening view of the lights of the Chicago skyline. 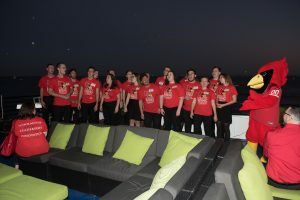 The Madrigals perform topside of the Mystic Blue at the Redbirds Rising Chicago campaign event. At the close of the evening, President Larry Dietz provided an update on campaign progress. Having achieved the second-highest fundraising year on record during fiscal year 2018, raising more than $21.9 million in private support, philanthropy is on the rise at Illinois State. The “quiet phase” of the campaign started in July 2013 and continued through the start of the public phase, which was announced on September 15, 2017. 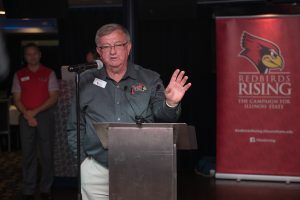 One year later, $124 million in gift commitments have been secured, putting Redbirds Rising 82 percent toward the goal of raising $150 million by June 2020. Campaign co-chair Dan Kelley addresses guests at the Redbirds Rising Chicago campaign event. Entering the second year of its public phase, Redbirds Rising has captured the attention of alumni and friends across the nation and around the world. 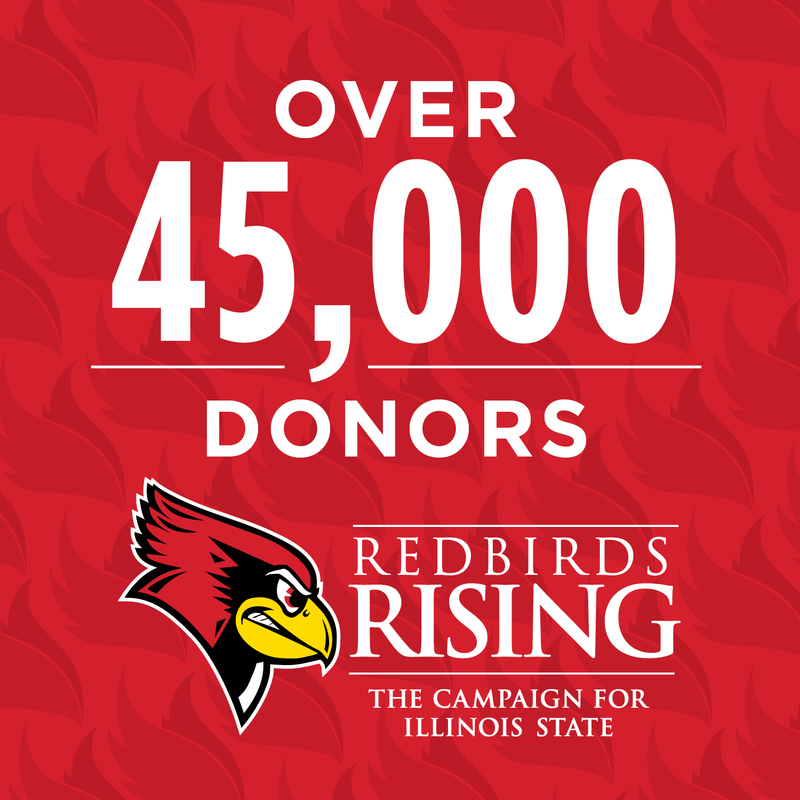 Redbirds in all 50 states and 63 countries have contributed to Redbirds Rising. To date, more than $53 million has been raised to support students, $9 million for faculty, $14.5 million for facilities, and $46.5 million for programs. Campaign co-chair Dan Kelley took a pragmatic view of the positive trajectory. 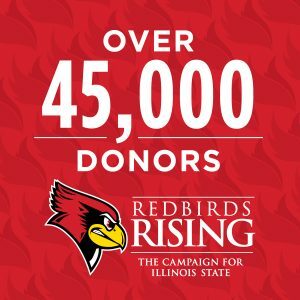 To learn more about how you can get involved with Redbirds Rising, visit RedbirdsRising.IllinoisState.edu or call (309) 438-8184. Follow Facebook.com/ISUGiving for campaign news and stories of impact. Click here for more photos from the campaign event.